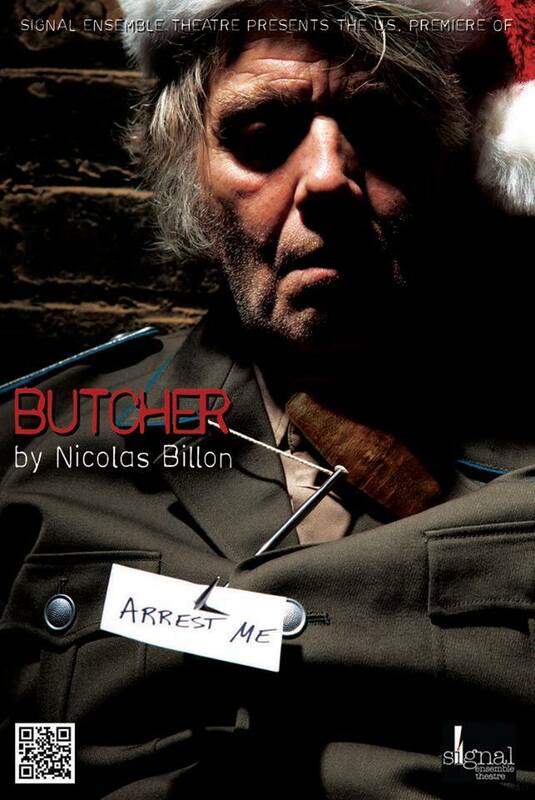 Signal Ensemble Theatre presents the U.S. premiere of BUTCHER. This show went from what-the-heck to what-the-f#ck in about thirty minutes. And the last ten minutes were oh-my-God-oh-my-God-oh-my-God intense. After the curtain, I walked out of Signal a little wobbly from the brutality of what I heard and saw. The play starts out slow with three men at a police station on Christmas Eve. An antsy Todd Frugia (Inspector Lamb) wants to get home to his family. Yet, he’s forced to deal with the mysterious presence of Vincent Lonergan (Josef). Lonergan was dumped at the station wearing a general’s uniform and a Santa hat. He doesn’t speak English but around his neck was a butcher hook with a business card and the words ‘arrest me.‘ Frugia has called in Joseph Stearns (Hamilton Barnes) to help solve the riddle. The business card is Hamilton Barnes. Playwright Nicolas Billon’s set-up is mildly engaging. The interactions between Frugia-Lonergan-Stearns feel true to the circumstances. Frugia plays the inspector as a good old boy. He’s cracking jokes and over-sharing about his daughters. A pathetic Lonergan is moaning incoherently. And an annoyed Stearns is trying to politely weather the inconvenience. Except for the title of the play, this plot seems like it could turn into a heart-warming holiday show where the old guy is Santa. It doesn’t. He’s not. Director Bries Vannon keeps the reigns tight on his talented ensemble. He coaxes us into this room. He awakens our curiosity. And then he just starts smacking us around with the unraveling truth. Simone Roos arrives to help translate what is happening, what has happened, what will happen. Billon has given Roos‘ character several lengthy narratives. Roos delivers all of them with an unflinching determination. The way she reveals the content with little to no emotion is unnerving. Vannon has the suspense creeping along around twists and turns until it gets to a very dark and dangerous spot. And then he just pushes us over the edge. ME: I’m sorry I’m unsettled I just saw a grim play. UBER: It was really bad? ME: No. It was horrific but a great production. BUTCHER gouged deep and left me with nightmares for life.